Genealogist Lynn Serafinn explains how and why to cite genealogy sources, and how good research habits can help you fill in the gaps when records do not exist. They always CITE their sources. They regularly REVIEW their work. They KEEP NOTES of their research. 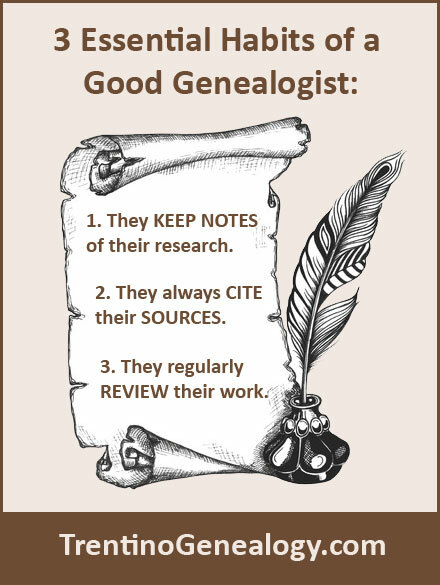 In fact, keeping good notes is so fundamental to research, I’m going to bump it up to #1 on the list of essential habits of a good genealogist: Click on image to see it larger. Please SHARE this meme with your family history friends on social media. Today, I want to talk about how these three habits work together in genealogy, and how they can help you create a trail of clues I like to call ‘genealogical breadcrumbs’, which can help lead you to the truth about your ancestors’ lives. As always, while some elements of this article will be specific to Trentini genealogy, most of the concepts are equally applicable to ANY family history research, regardless of origin. I also find it useful to make a note of how thoroughly you’ve checked; after all, there is a big difference between doing a ‘quick check’ or scouring through the records three times. Make notes of ANYTHING of which you are uncertain, as well as any possible conflicts of information you might have found (e.g. two children for a couple appear to have been born too closely together). Keeping such notes saves you time, as it helps ensure you don’t keep looking for the same records over and over (trust me, I’ve been there!). If you find a birth date of your ancestor Giuseppe in an official birth certificate, the birth certificate is the source. If you find an estimated birth year for Giuseppe via a census record, the census record is the source. If your Aunt Matilda told you Giuseppe’s birth date, Aunt Matilda is the source. If you have obtained Giuseppe’s birth date from all three of the above, then ALL THREE are your sources – even if they give you conflicting information. Primary sources are original documents of an event or person, such as a birth/baptismal record, marriage record, death record or military record. Secondary sources are quotes, opinions or other third-party accounts of an event or person, such as a book, article, letter or personal discussion. In my opinion, certain records – such as census records – can be both primary and secondary sources. For example, it is a primary source for a person’s address on a specific date, but a secondary source of a person’s name or estimated year of birth (and they are often WRONG). What Are ‘Source Citations’ and What Do You Put in Them? Santa Croce del Bleggio Parish Records (Santa Croce del Bleggio, Trento, Trentino-Alto Adige, Italy). Trento file 4256260_00985; Santa Croce parish records, marriages. LDS film 1448051, part 5, no page numbers. If that looks like a lot of writing, the first two lines are a template I set up in Family Tree Maker. I set one up for every parish I research. That way, I can pull down the template and insert the information about the specific reference, which you see on line 3. Even that is a ‘template’ I’ve made up, to enable me (or others) to locate the records where I obtained the information. In this case, ‘Trento file’ refers to the number of the digital image I obtained in Trento, and it really is only relevant to people who do research there, as these files are not available outside the archives. The reference to the ‘LDS microfilm’ is so that people who might be doing research at their local Family History Centre can find the exact page where the record is located. Of course, the FHC are retiring their microfilm service at the end of August 2017, so this information will become less relevant as they move over to digital images in the next few years. Even if your source is a word-of-mouth account, you can (and should) cite the person’s name, and possibly the year in which he/she provided the information. You might also wish to say whether they gave you the information from memory or if they had any documentation. Don’t forget to cite YOURSELF as a source if providing information from first-hand knowledge, e.g. your own birth date, the birth dates of your immediate family members, etc. There is no ‘set in stone’ method for citing sources, and yours don’t need to be as detailed as mine. But once you understand the reasons why it’s important to cite your genealogical sources (which we’ll look at next), you too might wish to be more thorough in your citations. Why Are Source Citations Essential in Genealogy? CREDIBILITY. As I said in my earlier article, ‘The Science of Finding Your Female Ancestors from Trentino’, genealogy is all about formulating hypotheses and then finding evidence to support or dispute it. Without at least one reliable source, our ‘facts’ are meaningless. The more reliable sources you have to back up a claim, the more likely it is that our ‘facts’ are true. Generally, primary sources are considered more ‘reliable’ than secondary sources such as word-of-mouth, books or other people’s family trees (see my additional comments about this below*). ATTRIBUTION. There isn’t a researcher on the planet who hasn’t found information from someplace else. While sometimes that information is a primary source (like a parish record), other times it has come from someone else’s research. Regardless of whether you are using primary or secondary sources, you MUST give proper attribution. Otherwise, you are plagiarising someone else’s work and/or intellectual property. Proper attribution will also provide evidence of the reliability of the original source. CROSS-CHECKING. Genealogy is a continually unfolding process. In other words, you (and others) will continually unravel new mysteries, even after you have found evidence for a specific person. Sometimes, the information you have found for one person is crucial in helping solve the mystery of another. OR, sometimes the information you have put on the tree was entered incorrectly or was incomplete. Incorrect/incomplete information is especially common when you are just starting out and you don’t understand how to interpret the records properly. If you have carefully cited your sources, you can return to the original document, reassess it, and fix the incorrect or incomplete information. Citing your sources also enables OTHER researchers – either family members or people you may not even know yet – to cross-check and/or expand upon your information. * SOMETHING IMPORTANT TO CONSIDER: Ancestry dot com gives you the ability to cite another person’s tree as a source. That’s all well and good, but if that person’s tree has no reliable (preferably primary) sources to back up their information, such a ‘source’ is no proof at all. I know it can be tempting to build your family tree as quickly as possible, but piecing together your ancestry using other people’s unsubstantiated information is likely to lead you WAY off track, and you will end up disappointed when you find out much of your family history is simply untrue. IN MARRIAGE RECORDS: Before the name of a deceased father and/or grandfather of the bride or groom. In the latter part of the 19th century, you will also start to see it used to refer to a deceased mother of a bride/groom. IN BAPTISMAL RECORDS: Before the name of a deceased paternal grandfather. IN BAPTISMAL RECORDS: Before the name of a deceased father of an unmarried woman, or the deceased husband of a widowed woman, when she is the godmother of the child being baptised. While such inferred information isn’t precise, it can help you create an estimated date of death for the person cited as deceased, as you know they died sometime before that event. Thus, you can enter an estimated date of death for that person, putting something like ‘Before March 1692’ in the date field on your tree. Less commonly, the word posthumous may appear before the name of the father in a baptismal record. This means the father died sometime between the date of conception and the birth of the child. This helps you narrow down the date of death to roughly a 9-month window. In this case, you can put something like ‘Between Jan – Aug 1709’ in your date field. Be sure to cite the SOURCE(s) from which you INFERRED the estimate. Because you are likely to forget why you made that estimate in the first place. This could lead you to CHANGE the estimate to a date that is less precise or altogether incorrect. Because you may have made a mistake when you interpreted the record. Unless you know how to find your way back to the original record, you won’t be able to locate the source of the error. Without being able to check the original record, you might continue to conduct your research based on incorrect assumptions. Next, I explained how I deduced that estimate, saying that Gaspare was alive when his daughter Cattarina was born in February 1637, and that I ‘think’ he is cited as deceased in marriage record of his older daughter Margarita in July 1637. I say, ‘I think’ in this case, because I didn’t feel the handwriting on Margarita’s marriage record was 100% clear. I go on to say that I KNOW he was deceased by the time his other daughter Vittoria marries in 1657, as it is clearly written in that document. I then refer to five supporting source citations, which I linked to this estimated date. Each citation gives the Trento file, parish, page number, etc. as shown earlier. I also uploaded a couple of images for these sources, which helps the readers assess the evidence themselves. It also enables ME to go back and reread the documents, to see if I made any errors. Later, if I find other documents that give me an earlier or more precise date, I can change it, citing another source. In this way – even if there are no existing records – it is often possible to formulate a narrow range of dates during which an event took place. Creating estimates supported by source citations can also help speed up your searches through existing records. Let’s say you want to know the death date of your 5x great-grandfather, Giovanni. If you were to trawl through all the death records for his parish without having a rough idea of when he died, you’d probably end up searching aimlessly through hundreds of records, unsure whether ANY of them referred to your Giovanni. But if you have already formulated an estimate for his death, gleaned from information found in the marriage records of his children, or baptismal records of his grandchildren, you can limit the range of years in which you need to look. This will significantly decrease the amount of time you need to spend searching for a record, and increase the likelihood of finding the correct document. A cryptic word on a record you looked at ten times in the past might suddenly leap out and you and make sense. Your language skills might have improved since the last time you studied a set of records. You may have become more skilled at deciphering messy handwriting. You might have recently discovered that your family used a soprannome during a certain period, which means you may have missed them in the records when you looked last time. You might look at your tree and suddenly realise two people are the SAME person. You might suddenly realise someone you thought was related only by marriage is actually the father of your 10x great-grandfather. 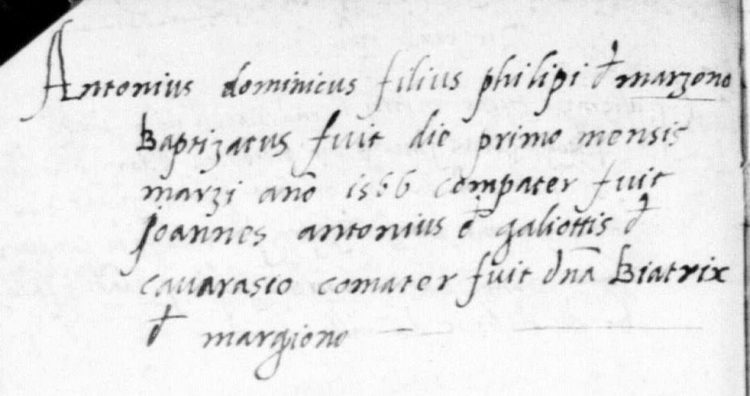 1566 Baptismal record for Antonio Domenico Frieri of Marazzone. There is no way ANY of us get it right – or complete – the first time around. Without regular review of our work, we may feel like we have hit a brick wall, while the information is staring us in the face and we simply haven’t yet noticed it. I hope you found this article useful and informative, and that it has inspired you to become a ‘master’ in our craft. Most of us who do genealogy are not only driven by a desire to find out about ourselves, but also by the wish to leave a valuable and lasting legacy for our children, grandchildren and extended family. To ensure that happens, we family historians must aspire to maintain the highest standards in every aspect of our research. As I said, while keeping notes, citing sources and reviewing one’s work might seem like the less ‘glamourous’ side of genealogy, they are the activities that will help your visions become reality. 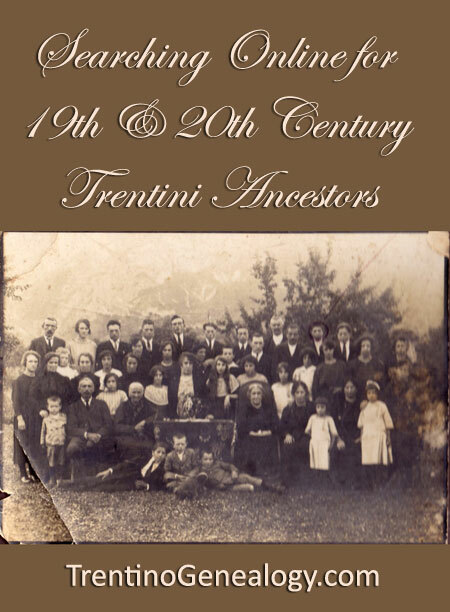 I would welcome any comments or questions on this, or any other topic to do with Trentino Genealogy. Please feel free to express yourself by leaving a comment in the box below, or drop me a line using the contact form on this site. Until next time, enjoy the journey. P.S. : I am going back to Trento to do research on August 16th, 2017. If you would like me to try to look for something while I am there, please first read my ‘Genealogy Services’ page, and then drop me a line using the Contact form on this site. I look forward to hearing from you! Subscribe to receive all upcoming articles from Trentino Genealogy! Desktop viewers can subscribe using the form at the right side at the top of your screen. If you are viewing on a mobile device and cannot see the form, you can subscribe by sending a blank email to trentinogenealogy@getresponse.net. 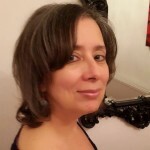 LYNN SERAFINN is a bestselling author, online marketing consultant and genealogist specialising in the families of the Giudicarie, where her father was born. She is also the author of the regularly featured column ‘Genealogy Corner’ for Filò Magazine: A Journal for Tyrolean Americans. Through extensive research, she has already linked together thousands of Trentini in an extended family tree. Her current research project is called ‘One Tree, One Family, One Humanity,’ the goal of which is create a genealogical ‘map’ of everyone either born in Bleggio, or whose ancestors came from there, from the 1400s to the current era, to serve as a visual and spiritual reminder of how we are all fundamentally connected. “One Tree. One Family. One Humanity”. currently being researched in the “One Tree” project. Baptismal record from 1567 where priest has omitted the father’s surname, Onorati. 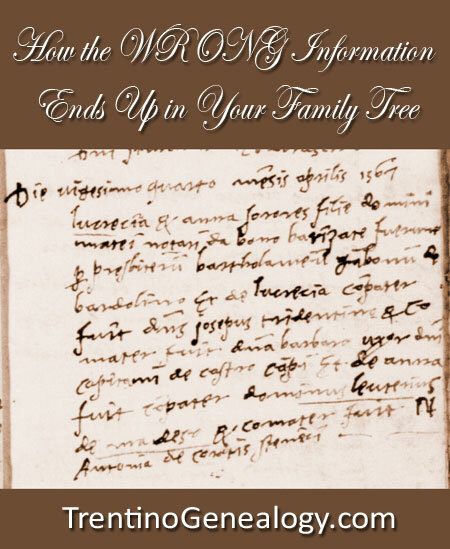 Genealogist Lynn Serafinn discusses 15 common ways we make mistakes in genealogy, and offers tips on how to separate fact from fiction in your family history. It’s easy to get hooked on the act of discovery when researching our family histories. We love finding new people and adding them to our tree, and can often feel disappointed if our tree hasn’t grown after a hard day of research. But sometimes, our desire for growth can make us careless. Lack of rigour in our research can bring many errors into our precious family trees – from incorrect dates to the wrong people. This is especially the case when we are just starting out and less experienced, both in the subject matter (our ancestors) and the process of research itself. Even when we are experienced, genealogy can be an informational nightmare. It’s bad enough trying to make sense of foreign, inaccurate or missing primary sources, but we must also contend with imperfect personal memories and simple human error. Then – with our trees and the trees of millions of others being freely available online – one mistake can become multiplied thousands of times over. That’s why I wanted to write an article about how we family historians can get it very WRONG, if we’re not as meticulous as possible in our work. While some of this article will cover things specific to Trentini genealogy, most of the concepts I will share are applicable to ANY family history research, regardless of origin. 1. Relying solely upon people’s memories or family hearsay. One of my father’s sisters wrote a very sweet love story about her parents’ early marital life (many years before she was born). In the story, she said they lived in Merano. The problem is, this is pure fiction. My grandparents never lived anywhere near Merano. My aunt made it up (probably because she had been born in the US, and had never actually visited Trentino). This colourful myth is still in circulation within the family, and it’s really difficult to get people to ‘unbelieve’ something after they’ve believed it so long. One of my clients gave me a death date for her great-granduncle. But the more I researched him, I could find no evidence to back up this date. When I asked where she had gotten this date, she told me someone in her family had given it to her, but she had no documentation for it. So, assuming this date was incorrect, I started my search from scratch. Eventually, I found the correct record – a good 20 years earlier than the date her relative had told her! To this day, we have no idea how the fictitious date was even conjured. 2. Copying or merging information from someone else’s tree. Websites like Ancestry and MyHeritage are very enthusiastic about giving you ‘hints’ for your ancestors. Often these hints come from information in other members’ trees. The problem is, unless you know the person who made the tree, and have complete faith in their competence as a researcher, it’s a REALLY (really, really!) bad idea to copy that information onto your tree – especially if they have not cited any sources or provided any images of original documents. Furthermore, even if the information they have is 100% correct for THEIR ancestor, it doesn’t necessarily mean the ‘hint’ you’ve received is for YOUR ancestor. Merging people into your tree via these online hints is one of the fastest ways to compromise the quality of your work and turn your tree into a complete fiction. If you believe you’ve found the right person, manually copy the information into your tree, with accurate notes about who you got the information from, so you can verify it later. Research is always a case of taking information from one source and writing it down in another place. For example, if you find a birth date, you have to enter it into your tree. It’s easy for a slip of the finger to result in a misspelled name or incorrect date, so careful proofreading before uploading your information is always the best policy. Reviewing your work regularly (an idea we’ll come back to in the next article) is another good habit to develop, as you’re bound to find typos lurking in places you may not have checked. 4. Lack of familiarity with the language. If you’re unfamiliar with the language in which a record is written, it’s easy to get it wrong when you are trying to translate it. In Trentino, virtually all official documents before the mid-19th century (whether church or secular) are written in Latin. Later, they start to shift into Italian. Fortunately, you don’t have to be a Latin scholar or be fluent in Italian to make sense of most of the relevant details, but you do need at least some understanding of the language. 5. Lack of familiarity with the date conventions. Figure 1: Baptismal record from 1669 – CLICK IMAGE to see it larger. Figure 2: 1670 baptismal record of Giovanni Parisi of Bono, Santa Croce del Bleggio, diocese of Trento. In Figure 1, you’ll see the priest wrote ‘Xbre’ for the name of the month. If you remember Roman numerals, ‘X’ represents the number 10. So, you MIGHT assume ‘Xbre’ means October, the 10th month, yes? Well, you’d be wrong. ‘Xbre’ stands for DECEMBER, the 12th month. Why? Because the Italian word for ‘10’ is dieci. Although dieci MEANS ‘10’, it SOUNDS like the Italian word for December – dicembre. So, when you see ‘Xbre’ it is shorthand for December. Figure 2 gives a similar example. The month is written ‘7bre’. This time the priest did not use a Roman numeral, but the regular (Arabic) number ‘7’. Again, you might thing this refers to the 7th month, i.e. July, but it doesn’t. In Italian, ‘7’ is pronounced sette, so ‘7bre’ is shorthand for the month of SEPTEMBER. The last four months of the year are frequently abbreviated in this way (October is ‘8bre’ and November is ‘9bre’). The reason might have something to do with the fact that these months were originally the seventh, eighth, ninth and tenth months of the year; but given the fact that the current calendar was introduced much before the 17th century, I think it’s just the way the priests heard the words in their heads. But, if you’re looking at the words as numbers rather than hearing them as sounds, you could easily record the wrong month for your ancestor’s birthday. 6. Lack of familiarity with toponymy/geography. Knowing the names of local parishes and villages (frazioni), as well as the names of contingent and more distance places in the region, is also an essential skill if we are to avoid mistakes in our family trees. I once saw a tree in which every child in the family was born in a different village, some of which were hundreds of miles from each other. While we in the 21st century may be accustomed to moving around frequently, this was less common in the past. This error happened because the man who made the tree was unfamiliar with Trentino and had no idea where places were on the map. Using an online database, he entered all the names he believed matched his search, but it was almost entirely incorrect. Good genealogists don’t just look up names and dates; they also take the time to learn about the places they are researching. 7. Lack of familiarity with the local surnames (and how they evolved over time). The name ‘Gusmerotti’ was originally derived from the first name ‘Gosmero’ (the suffix ‘-otti’ meaning ‘big’). Thus, some very early records that say ‘Gosmero’ or ‘Gosmeri’ are typically predecessors of those who later called themselves Gusmerotti. When I first started my research, I failed to notice many of my early Gusmerotti ancestors’ records because the surname didn’t have the ‘-otti’ ending. Several years ago, when I knew little about surnames in my father’s parish, I found a record written in very small, tight handwriting, in which the surname started with a ‘G’, had ‘u’, ‘m’ and ‘t’ in the middle, and ended in a vowel (but I wasn’t sure if it was an ‘i’ or an ‘a’). At the time, the only name I knew that fit these parameters was Gusmerotti, and I thusly assumed it to be so. Later, I realised it actually said ‘Giumenta’ (which means ‘mare’), a surname that became obsolete sometime in 17th century, having evolved into the name ‘Martinelli’, and then ‘Martini’. In fact, Martinelli is more than likely a sopranome that ‘stuck’ over time (we’ll look at sopranomi next). 8. Not recognising a sopranome when you see it. Rarely do sopranomi bear ANY resemblance to the surnames. Sopranomi change frequently, typically lasting only one to three generations before they morph into something else. A priest will often use a person’s sopranome INSTEAD of the surname, when he records an event. Sometimes a sopranome will permanently replace the surname, which can make it seem like a family has fallen off the face of the earth. Many sopranomi are also surnames – but of OTHER families! All these idiosyncrasies can cause you to miss one of your ancestors, attach someone to the wrong family, or assume you are looking at completely unrelated families. Unfortunately, the ONLY way to master the changes of sopranomi is to study the images of the original records of your family’s parish METICULOUSLY. There simply is no other way. Trying to understand handwritten documents can be a challenge even for the experienced genealogist, but it is especially difficult when you are new to research. Aside from the unpredictable spelling of names and places, and the frequent use of short-hand, sometimes the handwriting in the document is just plain MESSY! The only way to minimise mistakes caused by misreading handwriting is continual practice with images of original documents. Parish records often contain a lot of subtle information, which can be easy to miss if you read too quickly or not carefully enough. You might fail to notice ONE word indicating the fact that someone’s father was deceased, or that someone was a widow/widower when they married. A single word might indicate someone was NOT originally from the place they later lived, or that a godfather at a baptism was the brother of the mother of the child. Sometimes that single word is the only piece of information that will save you from months of fruitless – or inaccurate – research. Squeeze every bit of evidence out of your documents, and record every minute detail that tells the story of your family. 11. Drawing conclusions based on only ONE source. Major mistakes can creep into our tree if we base our assumptions on information we’ve gathered from only one source (i.e. a baptismal, marriage or death record) without cross-referencing it to anything else. This happened to me when I was just starting out. I stumbled upon the death record for one of my 2X great-grandfathers, Bernardino Luigi Onorati. The record listed his date of marriage to my 2X great-grandmother, Margarita Elisabetta Gusmerotti. I knew from the baptismal record of my great-grandfather (their son) that Margarita’s father’s name was Lorenzo. I looked on the Nati in Trentino website and quickly found a Margarita Elisabetta Gusmerotti, daughter of Lorenzo, born in 1818. Happy I had found the right woman, and knowing the date of their marriage, I proceeded to research my new Gusmerotti line, spending many weeks on microfilm at my local Family History Centre. 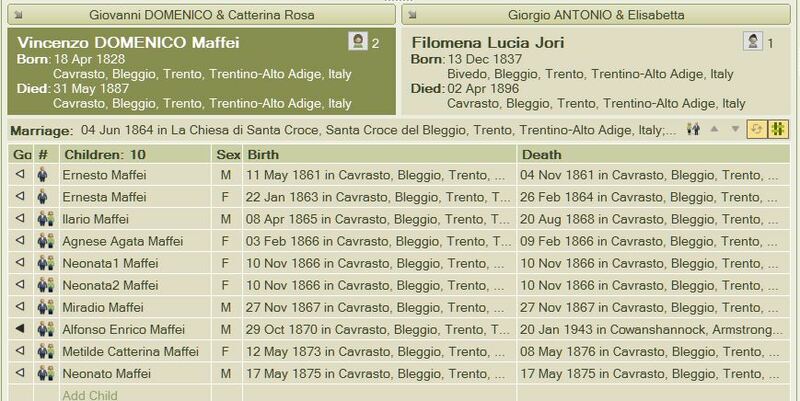 A few years later, I was in Trento and I suddenly realised I had never actually looked for the original marriage record of my Onorati 2X great-grandparents. As I now had access to digital images and my research abilities were vastly improved, I found the marriage record within minutes, rather than weeks. But when I read the document, my jaw dropped and I got a horrible sinking feeling in my stomach. The name of Margarita’s MOTHER was not what I had on my tree. Evidently, there were TWO different Margarita Elisabetta Gusmerottis, daughters of two different Lorenzos, and two different mothers, born around the same times. I had spent weeks (if not months) researching the WRONG families. After I stopped kicking myself for not having checked earlier, I went to work. I found my TRUE 2X great-grandmother – Margarita Elisabetta Rosa Gusmerotti, born four years earlier in 1814. Then, I got to work building her lineage – with the new Lorenzo and my newly-found 3X great-grandmother. Happily, however, as I have been researching the entire parish for the past several years, I was able to link her lines to many other people I already had on the tree, and I quickly traced many of her lines back to the early 1600s. 12. Searching solely for your ancestor, instead of your ancestor’s FAMILY. Have you ever taken a good look at your family tree, and think something along these lines? If not, you’re either really GOOD at catching mistakes, or you haven’t been careful ENOUGH in your research. Mistakes like these commonly happen when we find a record we believe to be our ancestor’s, and then STOP looking for anything else. Often, after we dig a little deeper, we might discover that the record we found was actually that of an older sibling who died when he/she was very young, for example. But because we want to feel like we’ve accomplished something after a day of research, it’s often tempting to tick off items on our ‘to do’ lists and move on to something else. Fastidious researchers don’t just look for their ancestors – they look for their ancestors’ families. I think of it as ‘building families’ – births, marriages and deaths of everyone in the nuclear family of my ancestor. This gives me a much more accurate picture of who everyone is, and the relationships between them. It also minimises the chances that I will connect someone to the wrong spouse at another generational level. 13. Not recognising when the PRIEST has made a mistake. It’s natural to want to believe parish records are 100% accurate, but unfortunately that is NOT the case. Parish priests may be dedicated to their spiritual duties, but they are also human. And like any other human being, they are prone to errors. Perhaps they miswrote a name because they heard it incorrectly, or they came from outside the parish and were unfamiliar with the local families. Maybe they didn’t have time to write it down carefully. Or, perhaps they felt it was unnecessary to specify every detail, as they assumed anyone reading the document would know who they were talking about. An example of this can be seen in the image of the baptismal record I used in title of this article, where the priest wrote ‘Matteo of Bono, notary’, omitting the surname ‘Onorati’. To him, it was obvious he was talking about Matteo Onorati; but to someone in the 21st century, it may not be immediately apparent, unless you are intimately acquainted with the records for that era. Or (and this might surprise you), perhaps they simply couldn’t be bothered. While most priests are fastidious record-keepers, I get the distinct impression that some of them really couldn’t stand the obligation of having to write everything down. That’s when they got messy, took short cuts, left out information – and made mistakes. The only way to evaluate documents you suspect contain errors is to complete the architecture for a family as thoroughly as possible (as discussed in the previous point). That way, you can recognise inconsistencies and anomalies more easily, and make sure one person’s error doesn’t steer you off course. 14. Depending too much on transcriptions. For example, the Ellis Island immigration documentation for my grandfather lists his village of origin as ‘Dunendo’. One of my cousins put ‘Dunendo’ on his tree, and wrote to me asking where it was because he couldn’t find it on the map. The problem is, ‘Dunendo’ doesn’t exist; the name of the village is Duvredo. The transcriber misread the handwriting, and the mistake then became ‘fact’. Census records are also notorious for incorrectly spelled names and incorrect ages. If you are depending upon these kinds of ‘official’ documents for information, use them with a pinch of salt, and NEVER assume transcriptions are accurate. 15. Depending too much on ‘Nati in Trentino’ or other online databases. In this digital era, we are used to ‘Googling’ everything. We want to do quick searches and find information right away. The problem is, to make things searchable, they must first be transcribed from other sources, and then filtered to respond to specific search parameters. We’ve already looked at the problems transcriptions can bring with them. Fortunately, the database on the Nati in Trentino website (see my previous article ‘Searching Online for 19th & 20th Century Trentini Ancestors’ about this site) is very WELL transcribed, making it fairly reliable for 19th century searches. However, you still have the limitations of what it DOESN’T show because it’s not included in its search parameters. For example, you cannot see the names of grandparents or godparents. You cannot see if a priest has made a notation that the child died shortly after baptism. Many people use Nati in Trentino when they first get started researching their Trentini ancestors, but it is a mistake to rely upon it as your sole source of information, because it will likely create errors in your tree. Errors are also likely to occur if you depend too much on the Family Search website. There, many Italian parish records have been transcribed by volunteers. These volunteers can only choose which parishes Family Search happens to be currently working on. Thus, it is highly likely the volunteers will be unfamiliar with the parishes whose records they are transcribing. There are many rules on how Family Search want the documents transcribed, which I found frustrating when I gave it a shot a few years ago. I stopped volunteering because I strongly felt these limitations create problems for the people using the database. 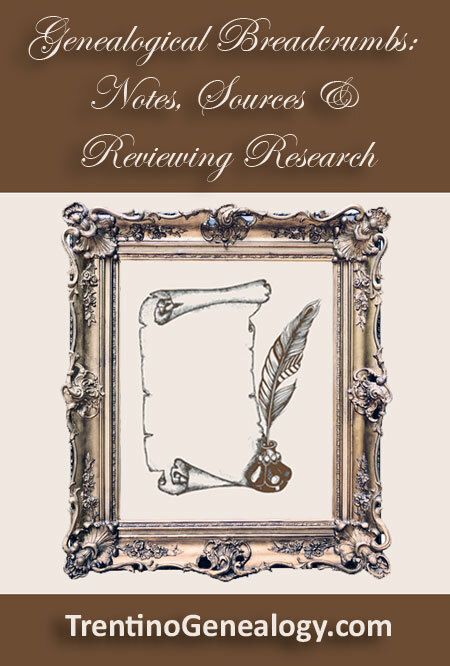 CONTINUOUSLY REVIEW YOUR WORK. No matter how long you have been doing genealogy, it’s unwise to take anything for granted. Your earlier work may contain errors you never noticed, or never addressed. Over the years, you may have inadvertently compounded these by assuming one thing to be true that wasn’t. Look for gaps, inconsistencies and conflicting information. Check, check and triple check. Next year, check it all again. ALWAYS CITE YOUR SOURCES. Source citations are like genealogical ‘breadcrumbs’. They enable you to trace back to where you found information and verify whether your conclusions are true. They also give other people confidence that your information is correct. Lastly, they give clues that point you in the right direction to find records or other family members. Even if your only source is a specific titbit is family hearsay, a phone call or a personal letter, always cite who gave you the information, and how/when you received it. In my next article, we’ll look specifically at citing sources – how to do it, why to do it, and how to use citations to back up HYPOTHESES you can formulate, even when the precise information may be missing. I hope you’ll subscribe to Trentino Genealogy to receive that and all upcoming articles. You can subscribe using the form at the right side at the top of your screen. If you are viewing the site on a mobile device and cannot see the form, you can subscribe by sending a blank email to trentinogenealogy@getresponse.net. I hope this article has given you some useful information that can help bring more accuracy into your work, and more confidence as a researcher. I would welcome any comments or questions on this, or any other topic to do with Trentino Genealogy. Please feel free to express yourself by leaving a comment in the box below, or drop me a line using the contact form on this site. P.S. : I am going back to Trento to do research in August 2017. If you would like me to try to look for something while I am there, please first read my ‘Genealogy Services’ page, and then drop me a line using the Contact form on this site. I look forward to hearing from you! Subscribe to receive all upcoming articles from Trentino Genealogy! Desktop viewers can subscribe using the form at the right side at the top of your screen. If you are viewing on a mobile device and cannot see the form, you can subscribe by sending a blank email to trentinogenealogy@getresponse.net. 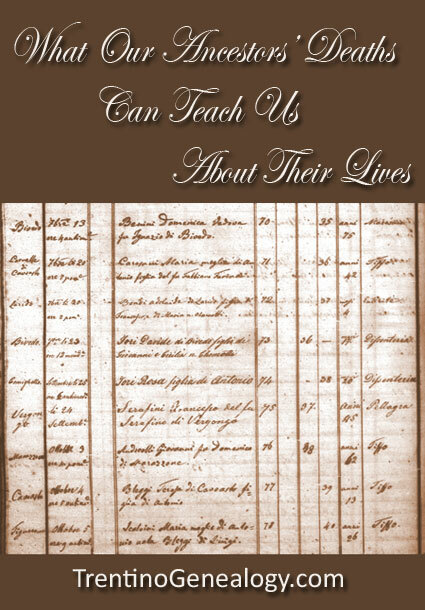 Lynn Serafinn explains the importance and challenges of including death information in your family tree, and discusses 10 causes of death in 19th century. He said this so often, and with such conviction that, now in my 60s, I can still hear his voice and see his face as he is saying it. The idea of our family surviving against all odds was a powerful, driving force for him – one that was fundamental to his identity. He saw his heritage as a part of the choreography of the ‘natural order’ of life, where only those who are strongest will survive and thrive. Certainly, his worldview played a role in shaping my own way of seeing the world – and myself – as I grew up. While, I admit, there is something seductively romantic about the idea that I have inherited the strength of my ‘survivor’ ancestors, my work in genealogy has caused me to reformulate my ideas on what exactly ‘survival’ means. We might imagine it means being able to withstand disease, overcome hardships, raise lots of children, and live to a ripe old age amongst our grandchildren or even great-grandchildren. But the reality of ‘survival’ of our Trentini ancestors often meant that they made it to adulthood at all. While it’s natural to imagine our great-great-great-grandparents as being wise, elderly people, the truth is, I am probably older right now than 95% of my ancestors were when they died. In fact, many of them died when they were younger than my 33-year-old daughter. How does this information reshape the way we see our ancestors – and ourselves? Moreover, what else can death and dying tell us about who we are, as a people? Those are some of the questions I hope to address in this article, where we’ll be taking a short tour of DEATH as part of LIFE in Trentino in the past. The importance of including death information in your family tree, and how it brings depth to our understanding. The challenges of using death records for information, and how to glean information from other sources if death records are unavailable or incomplete. Some common causes of death in 19th century parish records, and translations of some of the Italian terminology you might encounter. When we research our personal genealogy, it can be all too tempting (if not ‘addictive’) to go for quantity over quality. We love the feeling of discovering one more person to add to our tree. Perhaps we’ve finally found the marriage record revealing the name of our great-great-great-grandmother, or we’ve unexpectedly come face-to-face with our 12x great-grandfather in a 16th century land agreement. It’s exciting – even emotionally stirring – when we make such wonderful discoveries. But Celia Heritage’s point is this: while birth and marriage information is certainly fundamental to our genealogical research, until we know something about our ancestors’ deaths, we cannot get a truly accurate picture of their lives. If we really want to know where we come from, it is crucial for us to get into the practice of ‘killing off’ our ancestors, by discovering as much as possible about when, where and (hopefully) how they died. Learning about our ancestors’ deaths can often tell us more about them than anything else. After all, when we are born, we are simply a name and a hope for the future. But when we die, our lives have already happened. All that we have done and experienced precedes us. We have left an imprint upon our families and communities, and they upon us. We have formed relationships, and we have left people behind who are affected by our lives – and by our deaths. I would also add that it is just as important to research the deaths of ALL the members of your ancestors’ families, not merely those of your direct ancestors. Every death – even that of a new-born infant – has a physical, emotional and sometimes financial impact on a family. A single death can be the trigger that causes people to marry, remarry or even move locations. I doubt, for example, my Serafini ancestors would have moved from the parish of Ragoli to Bleggio in 1658, had not the older brother of my 6x great-grandmother Pasqua died, leaving her the only child to inherit. Many of us from America and Britain are accustomed to looking for death information amongst the civil records. But in Trentino, civil registration only began in 1820. Prior to that, the primary record-keepers were Catholic priests in the local parish churches. As mentioned in a previous article on this site, while the keeping of parish records was first mandated by Catholic Church at the Council of Trento in 1563, it took a while for it to become regular practice throughout the Church. Moreover, the practice of recording deaths tended to show up significantly later than the keeping of records of births and marriages. In my father’s home parish, for example, birth and marriage records begin in 1565, but death records begin more than 80 years later, in 1638. Some Trentino parishes did not start keeping death records until the middle of the 18th century. Even when death records are available for a specific parish, the system for recording information is often erratic, until the middle of the 19th century, when it becomes more codified. While some records will tell you the age of people when they died, and some details about their familial lineage (e.g. ‘Giovanni Malacarne, son of Antonio of Sesto’ or ‘Marianna, born Gusmerotti, widow of Valentino Martini’), others will simply list the name and date of death. Moreover, before it became standard practice to include the deceased date of birth in the record, the cited age at the time of death is often just an estimate. Priests often rounded the number up or down to the nearest decade. Alternatively, a member of the family of the deceased may simply have guessed their loved one’s age when the priest asked them. When such vagaries arise in the absence of any other information, you might be able to go back to the birth or marriage records and confirm you’re matching the right record to the right person. But sometimes, you’re not so lucky, and the scanty and conflicting information on the death record will simply leave you scratching your head. If death records are missing altogether for the ancestor or period you are researching, there are other ways you can at least narrow down the range of dates before/ after/ between which your ancestors died. The best way to do this is to look for clues in baptismal and marriage records. When a child is born, his parents (especially the father) are typically cited in the baptismal record by referring to the child as ‘Giovanni, son of Paolo’, or ‘Cattarina, daughter of Giuseppe and Maria’ or something along those lines. Thus, in many records prior to the mid-19th century, we will see at least the paternal grandfather’s name in addition to the father’s (and, hopefully, the mother’s). As we progress towards the second half of the 19th century, we will start to see not only both grandfathers, but both grandmothers as well. The same is true for marriage records. The first two are Latin abbreviations. The first is shorthand for ‘figlio (or figlia) quondam’, which means son (or daughter) of the ‘once’ so-and-so (e.g. ‘Antonio, son of the once Giovanni who is no longer with us’). The second is shorthand for ‘figlio/figlia gigantum’, meaning ‘son/daughter of the deceased’ so-and-so. Occasionally you will also see words like obit or defuntus, but these are less common in birth records. Giovanni di Antonio e fu Domenica, would mean Giovanni’s father Antonio was still alive, but his mother Domenica had passed away. Giovanni di fu Antonio e Domenica (or ‘vivente Domenica’), would mean his father was deceased, but his mother was still alive. Giovanni di furono Antonio e Domenica, would mean that both of Giovanni’s parents were deceased. TIP: When reading baptismal and marriage records, don’t forget to check the godparents and witnesses, as these will also often have references to deceased fathers and husbands. If you look diligently enough, you will probably find some unexpected clues about an ancestor’s death date. If I am looking at a marriage dated 5 May 1742, and the husband is cited as ‘Giovanni di fu Antonio’, I will go to the death date for Antonio, and enter the words ‘Before 5 May 1742’. Then, in the description field or notes for his death (I use Family Tree Maker for this), I put something like: ‘Cited as deceased in the marriage record of his son Giovanni on 5 May 1742’. Finally, I cite the SOURCE of the record. 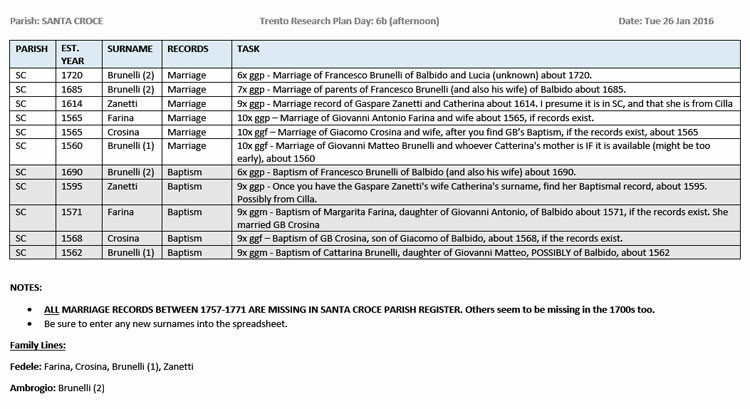 For example: ‘Santa Croce parish records, marriages. LDS film 1448051, part 9, page 108’. As I get many of my digital images directly from the Archdiocese of Trento, I also enter the number of the file in the Trento system. Suppose, a few months later, I happen to stumble across a baptismal record dated 10 April 1737, where Antonio is cited as being the godfather of one of his neighbour’s children. This new information gives me a lower boundary for Antonio’s death (i.e., he had to have died after 10 April 1737). Now, I can go back to my record for him, and alter the estimated death date to ‘Between 10 April 1737 and 5 May 1742’, narrowing it to a 6-year window. Keeping a careful log of all the clues you stumble upon in your research helps make finding death records easier later, and helps fill in the gaps if the original death records happen to be missing. 1750 baptismal record for Giovanni Antonio Caresani, whose deceased father Antonio is referred to as ‘posthumous’. Santa Croce del Bleggio parish records. 1750 death record of Antonio Caresani of Madice, who died at the age of 33. Santa Croce del Bleggio parish records. Note the death record says Antonio Caresani died at the age of 30. In this case, I already had Antonio’s birth information, but if I hadn’t, this information could have helped me locate his baptismal record. As I mentioned earlier, however, the given age on death records is OFTEN imprecise. In this case, the priest is off by three years, as Antonio was actually 33 years old, not 30, when he passed away. Sadly, as is often the case with pre-19th century records, the record provides us with no cause of death. We can only wonder why a young man in the prime of his life died, leaving behind a young wife and at least two living children, who would later become my direct ancestors. In an earlier article on this blog I wrote about using the Nati in Trentino website for genealogical research. That site contains a searchable database of Trentini births/baptismal by the Catholic church between the years of 1815 and 1923. 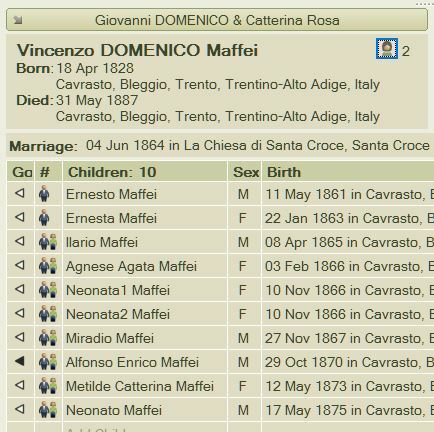 Births of the 10 children of Vincenzo Domenico Maffei, between 1861 and 1875. The first two children are via Domenico’s first wife, Angela, who died from tuberculosis in 1863, less than 3 months after the birth of her daughter, Ernesta. The other 8 children are via Domenico’s second wife, Filomena, whom you’ll meet in a minute. Have a look at the twin girls Neonata1 and Neonata2 born in 1866, and the boy Neonato born in 1875. The terms neonato (for a boy) and neonata (for a girl) are NOT names; they simply mean ‘new-born’, and are used to indicate an unnamed, stillborn child, or one that died before it could be baptised (which was often on the same day). Another frequently appearing term in the parish records is innominato or innominata (‘unnamed male’ or ‘unnamed female’, respectively), which conveys the same meaning. Have a look at the right-hand column underneath the word ‘death’. I obtained the death dates for ALL these children (except Alfonso’s) from their baptismal records. Many 19th century priests (at least in Santa Croce) would make notations about a persons’ death – and sometimes marriage – into that person’s baptismal record, even if it occurred years after the fact. Although death dates rarely appear in baptismal records before the 19th century, priests will often infer that a child died young, by putting a cross (+) next to the infant’s name in the record. While inconsistently used, you can find evidence of this practice even in very early records. Shockingly, the notations in the baptismal records reveal that all but one of Domenico’s 10 children died under the age of 4. One little boy, Maradio born in 1867, managed to be baptised, but died later the same day. The only child to survive to adulthood is Alfonso, born 1870 – who ended up becoming the great-grandfather of one of my 9th cousins, who lives in the US. Within a span of 14 years, Domenico saw the death of NINE children and a wife. Within the span of a decade Filomena gave birth to 8 children, only one of whom outlived her. Alfonso lost his father Domenico when he is 15 years old, leaving him to care for his widowed mother. It simply boggles the mind, and changes our perspective of this family completely. Bearing in mind that it was not the standard practice to cite the cause of death until printed columns were introduced into the parish records around 1815, I’d like to round off this article by sharing some of the terminology you might see cited as ’cause of death’ in the mid-to-late 19th century. I believe seeing all these maladies lined up one after the other can really make the weight of our ancestors’ lives sink in. In fact, it kind of hits you like a brick. It would be impossible to talk about all the possible causes of death in a single blog article. Really, it would take a book (and a LOT of research). So for now, I’m going to limit my discussion to 10 terms that might be more cryptic or less familiar to English speakers in the 21st century. The reason why they may be less familiar is partially because some of these diseases are not as common today as they were in the past, and partially because the terms themselves have changed over the past two centuries. I’ve broken these 10 common causes into two categories: those that mostly affect infants and young children, and those that mostly affect adults, including the elderly. I’ll warn you in advance, you may feel like crying. These are all Italian terms for ‘pertussis’, more commonly known today as whooping cough. Whooping cough is a highly contagious, airborne, bacterial disease causing violent coughing fits, often leading to fatal complications. New-borns and babies under the age of one year are most at risk. Although doctors today use vaccines and antibiotics to prevent/treat the disease, it still claims the lives of many infants every year, even in ‘developed’ countries. In one record, I also saw the term catarro soffocato. As ‘catarrh’ (catarro) refers to thick phlegm in the respiratory tract, this term means the baby suffocated on his/her own phlegm. My guess is that this might also indicate the child had whooping cough. This is the old Italian term for influenza or flu. The same term was used in English in the past, and the word grippe still means influenza in modern French. Historically, flu epidemics have claimed the lives of millions of people over the centuries, as the virus continually mutates as humans adapt to it. While adults often succumb to more virulent forms of influenza, babies and infants are often cited to have died from the more common winter strain of it throughout the 19th century. For further reading, an interesting book on the so-called ‘Spanish Influenza’ of 1918 is Flu: The Story Of The Great Influenza Pandemic of 1918 and the Search for the Virus that Caused It by Gina Kolata (http://amzn.to/2haAUge). While not about Trentino, it gives terrific insight into the nature of epidemic diseases, and the challenges of protecting ourselves from them. The literal translation is ‘dysentery’, which, technically, refers to an aggressive attack of parasites in the digestive track. Dysentery can cause high fever, diarrhoea and vomiting. In the case of infants (especially those still being breast-fed), I feel the term disenteria may more likely indicate they were suffering from chronic diarrhoea rather than actual parasites, eventually dying from dehydration. Today, few of us think of diarrhoea as a lethal threat, but back then many babies and children died from it, all over the world. Worms! I had never heard this term before working with the Trentini death records, but apparently, the term ‘vermination’ was also used in 19th century English medical texts. Vermination is any kind of worm infestation in the intestinal tract. In babies, vermination can also cause painful convulsions. Believe it or not, I found a book from 1836 on Google Books with the somewhat catchy title of Medical commentaries on puerperal fever, vermination, and water in the head by a medical doctor named John Alexander. Dr. Alexander confesses that (at least at that time) doctors simply didn’t KNOW what causes babies to get worms. Literally ‘incomplete development’, this refers to a premature baby. Back then, if a baby was born prematurely, there was little hope for survival. We I first started working with death records, I was shocked to see how many infant deaths in the 19th century were actually due to premature births. My only guess for these high numbers is that perhaps a great many pregnancies failed to go full-term due to poor nutrition and lack of pre-natal care. Called the same in English, pellagra is an insidious lethal disease caused by a chronic deficiency of niacin (vitamin B6) in the diet. It is most commonly seen in populations where their diet consists mainly of corn (as in polenta), with few other sources of nutrition. This is because corn that has not been cured with lime can leech niacin from the body, unless there is ample supply of the nutrient from other food sources. During the 19th century, when many contadini in Trentino suffered economic hardship, diversity of diet was difficult. Although often fatal, pellagra is easily curable in all but the most advanced cases through dietary and nutritional changes. But unfortunately for many of our ancestors, niacin and its role in the disease was not discovered until the 1930s. If you are interested in reading more about pellagra, I highly recommend the book A Plague Of Corn: A Social History Of Pellagra by Daphne Roe (http://amzn.to/2hk0HW9). Extremely well-written and insightful, she also includes one chapter where she talks about how the ‘polenta eaters’ in places like Trentino were impacted by this horrible disease. These are all terms for pulmonary tuberculosis, commonly called ‘consumption’ in the 19th century. Tuberculosis was so endemic in Europe in the 19th century (and even to the early decades of the 20th century), that it forms the backdrop for many novels, plays and operas of those times. Attacking the lungs, it frequently struck down young adults in the prime of their lives. Some pages in the death records will have many tisi deaths, one after the other, all people in their 20s and 30s. Typhus, a bacterial disease often equated with wartime, it can be transmitted by lice, ticks, mites or fleas when people live in cramped quarters, and have insufficient hygienic facilities. Once it takes hold in a community, it can spread virulently. Thus, if you see one case of tifo, you’re bound to see many others within a short time span. The literal translation is ‘apoplexy’, an English which today refers to a stroke. However, in the past, the word apoplexy was used to refer to any kind of sudden death (often preceded by unconsciousness), including stroke, heart attack and aneurysms. Literally ‘decay’, this term was used to refer to dying of ‘old age’ rather than any specified disease or condition. You will only see it used with people of advanced age (usually 70 or older), and refers to the decline in bodily functions, muscle mass, bones, etc. Occasionally, you will see the term marasma senile, which is used where there is extreme wasting/weight-loss. Most of the sources I have read do not necessarily tie it to the word ‘senility’ or dementia, but it is possible these ailments would also fall under this ‘catch-all’ term. There is so much more we could discuss when it comes to talking about how our ancestors died. We could talk about ‘La Peste’ of 1630, which wiped entire villages off the map. We could talk about the world-wide cholera epidemic of 1855, which took its toll on Trentino. We could talk about the thousands of men and women who died between 1914 and 1918, during the First World War. Throughout history, the Trentini people have experienced it all – famines and floods, plagues and epidemics, war and economic hardships. And while these things certainly took their toll on individuals and families, we – as a people – have survived. We identify with our culture; we recognise it as fundamental to who we are. Even those of us who are the children (or grandchildren) of those who emigrated to other lands, are still Trentini. I hope this article has inspired you to become as curious about learning about your ancestors’ deaths, as you are about their births, marriages, and other life events. I also hope it has given you some useful tips and information to help you in your research. I would welcome any comments or questions on this, or any other topic to do with Trentino Genealogy. Please feel free to express yourself by leaving a comment in the box below, or drop me a line using the contact form on this site. P.S. : I am going back to Trento to do research in January 2017. If you would like me to try to look for something while I am there, please first read my ‘Genealogy Services’ page, and then drop me a line using the Contact form on this site. I look forward to hearing from you! Image: Title page of 17th-century baptismal record book from the parish of Drò (Trentino, Italy) drawn by the parish priest, Francesco Giuliani. Genealogist Lynn Serafinn tells what you can find at the Church Archives in Trento, Italy, and shares crucial tips for how to prepare BEFORE you make the trip. For me, one of the most beautiful places on early is the city of Trento, a hidden gem in the Dolomites (part of the Alps) in northern Italy. Apart from Rome, the city of Trento is arguably the most important place in the history of Christianity, especially as the venue of the Concilio di Trento aka Concilio Tridentino (Council of Trent) in the mid-1500s. But Trento is also a vital place for modern historians, as it is home to a wealth of archival repositories, including the State Archives, the Archives at the Castello di Buonconsiglio, and the Archives of the Catholic Archdiocese of Trento. It is the last of these – the diocesan archives – that we’ll be looking at today. SIDE NOTE: ‘Trento’ is sometimes referred to as ‘Tridentino’, and things to do with Trento are sometimes called ‘Tridentine’. In English, you will frequently see it written simply as ‘Trent’, undoubtedly due to the influence of Austria and the Germanic influence of the Holy Roman Empire, which ruled the area for many centuries. The Tridentine Diocesan Archives preserves, stores and makes available to the public many original historical writings of the bishops of Trento and many other individuals and institutions. But what is of most interest to genealogists is that they have an excellent on-site facility for viewing digitised images of all the baptisms, marriages and deaths of ALL the parishes within the Diocese of Trento, starting from the mid-16th century (when parish records began) until 31 December 1923. These digital images are NOT available online or at any other facility in the world. In the parish record room, there are five viewing stations, with each high-resolution computer screen measuring 70 cm x 40 cm (27.5 inches wide x 15.75 inches high), which is just about as large as you could ask for in a personal workstation. You have instant access to ALL the parishes of Trentino at your fingertips. Each parish is in its own folder, and then further divided into births, marriages and deaths. You’d have to pay a small fortune to have the microfilms of all of these parishes sent to your local Family History Centre. Computer displays are much brighter and crisper than most microfilm readers. You can quickly zoom in and out to enlarge the images. You can simply ‘click’ to the image you want, without the need to scroll through a whole film. As each image has a unique file number, you can quickly find it again later. You can have several windows open at one time, making it easier to compare records, or work on baptisms, marriages and/or deaths, or even different parishes at the same time. However, to be able to reap the full benefits of these features, it is important to know the ‘house rules’ at the Archives, as well as how to prepare before you make the trip. You cannot download the digital files yourself. You cannot take photos of the images off the screen using your phone or camera. If you look at the penultimate column on the right of the form, there is a space to write the file number you require. To ensure the archivists get the correct file for you, you will need to enter the parish, the type of record (baptism, marriage or death), the name of the person whose record you’re particularly interested in, the date of that specific record and the file number. Some archivists will give you the entire page, while others will crop the image and give you only the record you list, so be sure to be very clear when filling in the information. That they will be open the week/days you want to come. The centre is always closed for a couple of weeks in August, and also on national holidays. They might also occasionally need to close if some construction or a conference is taking place. That they can reserve a work station for you on the days you intend to be there. That someone who speaks English will be on site that day, if you do not speak Italian. The best way to communicate is via email at archivio@diocesitn.it. You can write in English if you need to, but if you can write in Italian (or find someone to write it for you), that would be best. The official website for Archives of the Archdiocese of Trento can be found by clicking here. At the Archives of the Archdiocese of Trento. 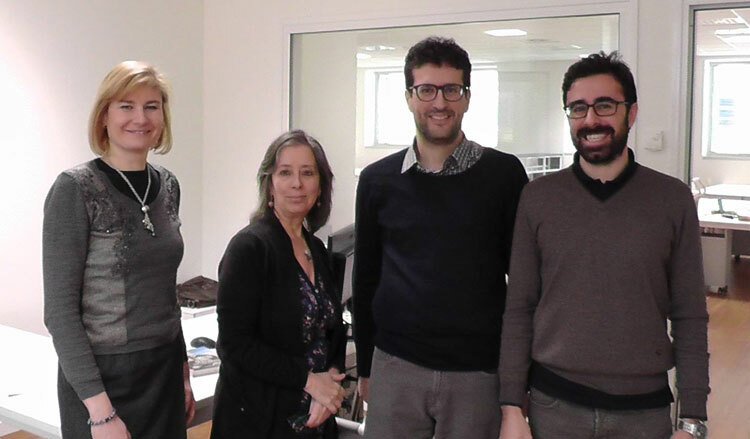 Left to right: Dr. Katia Pizzini (Assistant Director), Lynn Serafinn (genealogist), Dr. Claudio Andreolli (archivist), Dr. Renato Giacomelli (archivist). Although these are the ‘official’ hours, I still recommend you confirm them before your trip, as sometimes the centre needs to close early, and sometimes you might even get a ‘surprise’ bonus day where they are unexpectedly open when they would otherwise have been closed. Going to Trento can be a major trip for many researchers, especially if they are coming from a great distance. Thus, it is crucial that you make a detailed plan for what you want to achieve while you are there. Otherwise, you are likely to drift around the records (much as people surf the Internet) and go home without much to show for the time you’ve spent there. Thus, you will have a maximum of 29 hours for research per week (especially if you’re neurotic like me, and your backside stays glued to the chair for the entire day once you’ve sat down). IDENTIFY MISSING DATA: First, I systematically go through all the branches of the tree I am working on, and write down EVERY piece of vital information that is still missing (e.g. unknown marriage dates, incomplete names, etc.). One way to see this clearly is to generate a ‘pedigree chart’ using a genealogy programme like Family Tree Maker. That way, I can quickly see which ancestors are missing or incomplete. CREATE GROUPS: I then take this list and group all the missing/incomplete people according to parish, then their frazioni (villages) within the parish and then into surnames. The main reason I break them into frazioni is that some parish priest would group the records according to frazione, rather than mix them altogether in chronological order. 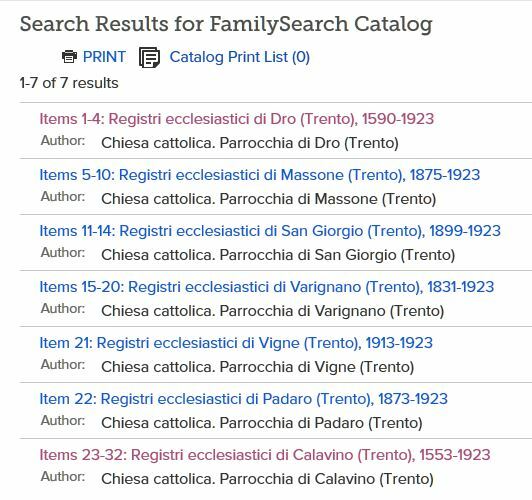 You may or may not need to be as detailed, if your particular parish does not categorise its records according to frazione. MAKE A REVERSE CHRONOLOGY: I then organise each group in reverse chronological order, so I can weave my way backwards when I do my research. There is little point in starting from the earliest records until I know how they connect with later generations. CREATE ‘BATCHES’: The next step is to take these groups, and bundle them into ‘batches’ of about 10 to 15 records etc. Each batch should have something in common. For example, they could be baptismal records of people who all have the same surname or live in the same frazione between a specific set of years (one or two generations). Or, I might chunk together all the marriages within a certain span of years. The reason I suggest 10 to 15 records in each batch is that this is the number you might expect to work through on a half-day session (3 to 4 hours). ORGANISE YOUR BATCHES IN ORDER OF PRIORITY: Once I’ve made my batches, I then sequence them in order of priority. Of all this information, what are the things I most want to find out on this research trip? Which things would be the most difficult to find at home, if I don’t try to find them in Trento? Which things could I leave to the end of my trip, and look for them only if I end up having extra time? ASSIGN RESEARCH SESSIONS TO EACH BATCH: Finally, I made a day-by-day plan by assigning each batch to a specific morning/afternoon session on a specific day on the trip. This enables me to pace myself each day, and shift gears if I feel like I’m getting nowhere. TWEAK AND REFINE: I look through my plan, and tweak it to ensure I have some ‘buffer’ time. Is there some area where I am being overly ambitious and trying to cram too much into one session? How can I lighten the load, in case some things take longer than others to find? PAGINATE, PRINT AND KEEP IT SAFE: When I am satisfied my plan is doable, I put the plan for each date onto a SEPARATE page in Word. In other words, 10 days of research means I have a 10-page plan. Then, I print it out, staple it together, put it in a plastic sleeve and then store it in a document wallet where I will keep all my notes for the trip. You might prefer not to print your plan, but I find it easier to have it sitting next to me on my workstation. That way I can keep my tablet available with my family tree software open, and not need to switch back and forth between screens. If you prefer, you can download a Word docx of this sample page by clicking here. Before you start working through your plan, I strongly recommend that you spend the first session (or perhaps the entire first day) creating a ‘map’ for yourself, showing where different records are located within the parish you are researching. Once you create this map, you won’t need to do it again, unless you start working with records from a different parish. What I mean by ‘map’ is a spreadsheet (or whatever system you prefer) where you list the range of file numbers that contain specific information. For example, as I said earlier, some parish records are organised according to frazioni. Thus, you might see records for a span of years ALL from a single frazione, and then all of a sudden the records leap back in time to the starting point, showing all the records for that time period for a different frazione. Sometimes (if you’re lucky) the priests will have put indices at the beginning of each book saying where these divisions occur, but this isn’t particularly useful if you’re searching for the records via file number. Thus, I might sit for a morning and go through, say, all the records for the 1600s, and write down the numbers of the first and last file within each sequence. How is this map useful to me? Well, let’s say that later in the week I am trying to find the birth record for a person born around 1660 in the village of Larido. From my map I can see that the records for 1646 – 1686 are spread across 21 files (01516 – 01536). Knowing that, I can probably guess that the file I’m looking for is probably just a bit before the mid-point of this span, say file 01522. I can go directly to that file, and probably locate the document I am looking for in 5 minutes or less. Without such a map, I’d be likely to spend hours – maybe all afternoon – trying to find it. Having a map like this also enables you to decide quickly whether a particular file is missing or (more likely) that the person was actually from a different frazione. Remember, when it comes to research, NOT finding a file is often just as informative as finding it. Once you create your map, you should work methodically through your plan, trying to stick to it as best you can. If you get ‘stuck’ trying to find a particular record, or you think you are spending too long on one thing, make some notes about what you already tried, and then move on to the next item in your plan. Maintaining some sort of momentum can help keep you from becoming bogged down and discouraged. When I go to Trento (or anywhere else), I like to use Family Tree Maker to enter all the new data I find, making sure to include the number of the file where I found the information. Rather than try to transcribe records while I’m researching, I use the order form to request the digital file of the records I want, so I can study them in greater detail later, when I am not under a time limitation. At the end of my research day, whenever I close Family Tree Maker, I created a ‘change log’ (which you can generate via the ‘sync’ button) and save it as a PDF file, so I can see exactly what I added, deleted or changed throughout the day. Only later do I sync the data to the online version of the tree, if I have one. To prevent myself from getting side-tracked, if I happen to stumble upon some interesting discoveries that are NOT included in my plan, I write down the file number, and order the digital file from the Archives, so I can look at it in more detail when I get home. This method is especially useful if I happen to find records on someone whose connection to my tree is not immediately apparent, but whom I suspect could turn out to be relevant later. Your familiarity with the parish, i.e. how well you know the frazioni, the local surnames, common sopranomi of certain families, etc. If you can give yourself high marks on all three of these things, you can comfortably expect to find at least four records per hour. I have often located more than 10 records within a single hour, because I knew exactly what I was looking for, and exactly where to find them. If you have had NO experience with the microfilms at all and/or you know next to nothing about your family or their parish, it does not mean you should not make the trip to the Archives. However, in this case, I suggest writing to them in advance asking whether someone who speaks English there can help you with your research. Try to bring as much concrete information about your ancestors as you can, such as birth names, birth/marriage years, parish, etc. OF COURSE, I am also available for hire as a genealogist, specialising in the family history of Trentino. I could mentor you through your research OR you could hire me to do the research for you. As an experienced author, I can also help construct your family history in writing. If you would like to discuss how we might work together, I invite you to write to me via the contact from on this website, and request a (free) 30-minute Skype chat, so we can get to know each other. One thing that can REALLY slow you down in your research is if you try to process all the information mentally while you are in the ‘discovery’ phase. Thus, my best advice to you would be to use your trip simply to FIND the files you need, and not to analyse them or transcribe them (unless you want to do that in the evening). Be sure you keep a good record of what you managed to find, and what you TRIED to find but could not. Then, assuming that you’ve obtained all the digital files you discovered, when you return home you can sit and spend as much time as you want studying, translating and ‘connecting the dots’ with your discoveries. Remember, hidden within a baptismal record for one of your ancestors could be the names of that child’s grandparents. Or, you might discover that a child’s godfather/godmother, or the witnesses at your ancestors’ wedding are yet OTHER ancestors of yours. You might see clues indicating they originally came from another parish. You might see hand-written notes indicating death dates, marriage dates, occupations or many other gems. There is no way to take it all in when you are on the hunt for the records themselves; what’s more, you shouldn’t try to. I am STILL working methodically through the 300+ pages of records I located and retrieved during my 5 weeks in Trento earlier this year. I have a special spreadsheet where I write down the number of each file, which village(s) it covers, the earliest and latest date in the file, and how many records it contains. I also make notes if there were some records I couldn’t read or understand in the file. This way, I always know which files I have already analysed, sparing me from accidentally repeating work I have already done. It also helps me identify which files I might still need to locate at a later date. Using this method, my primary tree has blossomed from about 1,000 people in December 2015 to (as of this writing) over 8,700 people, supported by nearly 1,500 digital images (old photos, civil documents, census records, parish records, and my transcriptions of the same). I am sure some of you are feeling a bit overwhelmed at this point. I’d like to quell your feelings by telling you about the very first time I went to the Trento Archives. Back then, I couldn’t yet speak Italian, and I had a very sparse tree through the 19th century with no actual images of the records. Bringing my Italian friend Vanessa with me as a translator, I went to see an archivist there named Claudio Andreolli (who speaks almost no English). Claudio knew I was coming, and I had given him all the information I had gathered so far. When I arrived, I was thrilled to discover that he had ALREADY traced my father’s Serafini line back to the late 1500s! While this was just the male line – about seven generations of Serafini grandfathers, with the names of some of their wives – this really kick-started my research, and everything I have done since blossomed from that point. Over the next year, I actually found a couple of errors in Claudio’s original research, which I corrected. However, when I did that, I discovered that Claudio himself was actually my 4th cousin. What an exciting discovery! I tell this story for two reasons. First, please remember that EVERYONE starts out as a beginner in genealogy. Second, don’t worry about MAKING MISTAKES. Every single researcher, no matter how learned or experienced, will make mistakes. The important thing is to check, double-check, and triple-check your work over time, as you gain experience and expertise. Sometimes the answers to things you didn’t know or corrections to mistakes you made in the past just sort of POP out at you, and you can’t figure out why you hadn’t seen them before. I hope you’ll subscribe to this blog so you can follow along on this genealogical journey, and read all future articles on this site. Desktop viewers can subscribe using the form at the right side at the top of your screen. If you are viewing on a mobile device and cannot see the form, you can subscribe by sending a blank email to trentinogenealogy@getresponse.net. I’ve also recently set up a ‘Trentino Genealogy’ Facebook Group, open to ANYONE interested in discussing genealogy, and meeting others who are researching their family history. Who knows? You might meet a long-lost cousin there! I also invite you to visit my own extended family tree, with thousands of Trentini, mostly from the Giudicarie valley. You can see that tree on Ancestry at https://www.ancestry.com/family-tree/tree/110809816/family. You will need to sign into your Ancestry account to see it. If you do not have an account, you can create one for free (you only need to pay if you want to access their search records). Lastly, if you have any questions or comments about this article, or if you’d like to talk to me about researching your family history, please feel free to drop me a line via the contact form on this site, or leave a comment at the bottom of this page. Genealogist Lynn Serafinn explains what to do before working with parish records on microfilm, and shares tips for finding your Trentini ancestors’ parish. If you’re new to genealogy, you’ll notice that family historians talk a lot about parish records (if you’re unfamiliar with parish records and what they can tell you, you might find some useful information in a previous article on this site called ‘Parishes, Parish Records & Genealogy Resources for Trentino’). While parish records are fundamental to nearly every family history, they are old and fragile documents that would not survive being handled by every modern researcher who comes along. The other challenge they present is that the original, handwritten records are kept as archives in their parish of origin, often thousands of miles away from those who would like to access them. To address both of these problems, back in the 1950s (or so I read somewhere) archivists at the archdiocese of Trento permitted historians at the Church of Jesus Christ of Latter Day Saints (LDS) to photograph these records and convert them into microfilm. The original films are kept in Salt Lake City, Utah, but copies can be rented (not purchased) by the public for a nominal fee, and viewed at their local Family History Centre (FHC). According to one source, there were more than 4,700 FHCs in 134 countries as of September 2014; it is my guess that this number has probably grown since then. You can find instructions for locating your local FHC by following the above link. These microfilms are what the majority of English-speaking family historians with roots in Trentino use for their research. However, finding your way around the microfilms is rarely straightforward, and extracting accurate information from them requires an organised approach and regular study. I can remember numerous occasions when I was trawling through microfilms at the National Archives in Kew, London, when a first-time enthusiast came in (probably after having watched a TV show like ‘Who Do You Think You Are?’) and turned on a microfilm reader, fully expecting they would be able to trace their family back 200 years in a single sitting. Nine times out of ten, the person gives up after an hour. Microfilms themselves are extremely unwieldy tools, and the challenges of using them are only compounded by the fact that the parish records themselves are even more unwieldy. 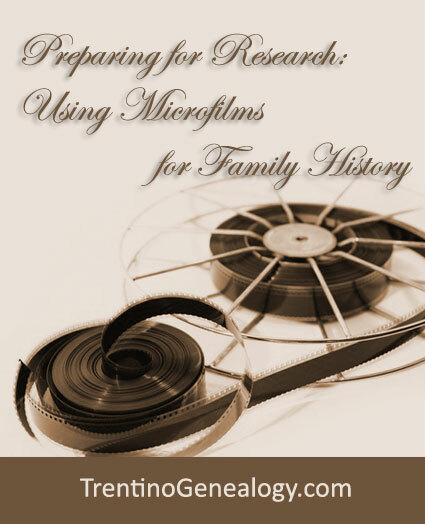 If you’re not ready to commit yourself to many days, weeks or months (or even years, if you’re really serious) of study to master both of these challenges, you are unlikely to find much joy in using microfilms to construct your family tree. Did your ancestors actually come from Trento? So many people of Trentino descent say to me, ‘My parents/grandparents came from Trento.’ But what they don’t always understand is that saying ‘Trento’ is kind of like saying ‘New York’. If you say you’re ‘from New York’, most people assume you mean New York City. However, ‘New York’ could also refer to New York State. So, simply saying ‘I’m from New York’ could lead people to misunderstand where you mean. The same is true for Trento. You’ve got Trento the city, and you’ve got Trento the province (also referred to as Trentino). Furthermore, you’ve got Trentino-Alto Adige – referred to as an autonomous region – which is comprised of the two provinces of Trentino (Italian speaking) and Alto Adige (largely German-speaking). On top of this, there is the Catholic archdiocese of Trento. SIDE NOTE: For those who may be unfamiliar, a ‘diocese’ or ‘archdiocese’ is a collection of many parishes under the ‘governance’ of an Archbishop – a high-ranking priest within the church. In my experience, when our parents/grandparents said they came ‘from Trento’ (or ‘Tirol’/‘Tyrol’ as so many of us heard when we were growing up), they were usually referring to the province of Trento (Trentino). The fact is, the majority of those who emigrated from Trentino to the Americas in the late 19th and early 20th century did not come from the city, but from rural villages (frazioni) scattered around the province. Each of these frazioni belongs to a parish and a single parish may be comprised of a dozen or more frazioni. ALL of the parishes of Trentino (over 400 of them) come under the umbrella of the Catholic archdiocese of Trento. Through your local FHC, you can rent individual microfilms for any of these 400+ parishes from the archdiocese of Trento. Thus, the very first thing you need to know is the name of your ancestors’ parish (or parishes). But what can you do if you DON’T have this information? Even though my father was born in Trentino, he never told me name of his frazione or parish of origin. Whenever I asked him where our family came from, he would say, ‘Near Trento.’ If I pressed him further for the name of the village, he would deflect my question by answering, ‘It’s not even a village. It’s barely even a hamlet. It’s so small it’s not even worth mentioning.’ And that would be the end of the conversation. To be honest, I’m not even sure he knew. Perhaps you were luckier that I was, and you know the name of the parish and/or frazioni of your Trentini ancestors. But if you don’t, all is not lost! Even if you have only a bit of information about your ancestors, you have a good chance of finding their parish using the Nati in Trentino website, which I mentioned in a previous article. Sometimes, simply having a surname and an approximate year of birth can reveal a definitive parish of origin. This is because many families lived entirely (or almost entirely) within a specific parish over the centuries. For example, let’s say I was trying to track down my father’s mother, Maria Onorati, and that I had only a rough idea that she was born in the early 1890s. In this case, if I search simply for females with the surname Onorati born between 1890 and 1895, ALL of the returns are from a single parish – Santa Croce del Bleggio (the Onorati lived almost exclusively in the village of Bono in that parish for many hundreds of years). You might discover that your family name is similarly ‘attached’ to a particular parish. Of course, many surnames will pop up in various parishes throughout the province. The more information you can put in the search form on Nati in Trentino, the more you will be able to narrow down your results (I recommend reading through my search tips in the previous article). If your search ends up giving you too many options, try to think laterally. Is there someone in your ancestor’s family – a sibling, perhaps – with a more unusual first name than your direct ancestor? For example, one of my grandmother’s sisters was named Rustica. This name is so uncommon I have only ever seen it once (i.e. in the baptismal record of my great-aunt). Searching for a ‘Rustica’ is far more likely to give me definitive results than searching for a ‘Maria’, and can therefore lead me to discovering not only the name of the parish, but also the names of the parents and other siblings. Another matter that might cause some confusion for you is that parishes are not static entities, and they will probably have gone through many changes over the centuries. Some parishes no longer exist today because they were incorporated into another parish at some point in time. Conversely, new parishes may spring up having separated from another parish as populations changed. Sometimes, smaller villages will be ‘passed back and forth’ between two (or more!) parishes over the years. This means you’ll need to cross-check records in both parishes lest you miss something. If you hit a ‘brick wall’ in your research, it could be due to this fluidity of parish boundaries. More than once I’ve accidentally stumbled upon a record I never thought I would find when I was browsing through a neighbouring parish. Another thing to remember is that, if a husband and wife in your lineage come from different parishes, it is probable their marriage was recorded in the registers of both parishes. This can be very useful if their marriage record in one of the parishes happens to be missing or unreadable. Once you are confident you have found the parish you want to research, you are ready to order a copy of the microfilm from the LDS website. Sometimes finding the correct film can be a bit tricky, if you don’t know your way around (and, in my experience, few people at the FHC centres understand enough Italian to be able to help you). In a new tab on your browser, log into your account at http://familysearch.org (if you don’t have an account, you can create one there for free). Once logged in, click the word ‘Catalogue’ in the top menu on your screen. When the search window opens, enter ‘Country, Diocese, Parish’ where it says ‘Place’. That is to say, if you are searching for a parish in the archdiocese of Trento, you should enter: Italy, Trento, Name of the Parish. SIDE NOTE: Even though Trentino was part of Austria prior to 1918, the records are listed under its current country (Italy). 4. When the search results for your parish pop up, CLICK the arrow next to the name to expand it. Then, click the link that says ‘Registri ecclesiastici’, etc. to open more information about it. 6. 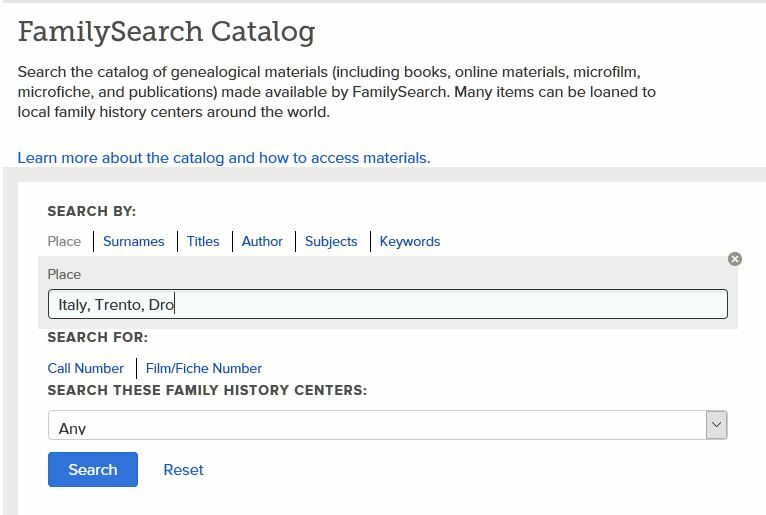 Once you know the NUMBERS of the films you need, you can order them from the Family Search website at https://familysearch.org/films/. Just enter the number of each film and choose either a ‘short term’ or ‘extended’ loan period. While an extended loan costs slightly more, I strongly recommend choosing that option if it is available so you don’t have to worry about rushing through your research. Otherwise, the usual length of short-term loans is about three months. You can renew them, but some centres will only allow you to renew them once. In my experience, every Family History Centre has its own rules about this, so be sure to check with them first before ordering your film. Before selecting which FHC you want to use to view the films, be sure to check their opening hours as many of the smaller centres are only open a few hours a week. You might find it better to have the films delivered to a centre slightly farther away, if their opening hours are more convenient for you. SIDE NOTE: SOME (but by no means all) of the actual images of the Trento parish records are viewable online, but you can only view these when using the site AT a Family History Centre or if you are a member of a ‘supporting organisation’. Also, some of the records have been transcribed and can be searched online using the Family Search site. However, this research is still in its very early stages, and the transcriptions do not give nearly as much information as you will find if you consult images of the original records. Organisation by frazione. Many priests chose to organise birth records by frazione. In other words, they would enter all the births for a particular frazione chronologically during a specific time period, and then start the same process all over again for the next one. The ‘specific time period’ could be anything – 5, 20 or even 50 years. This means you can’t just scroll through the film to find a particular record, you’ll need to know which frazione you’re looking for, and where that frazione and time period is located on the film. Otherwise, you’ll have no choice but to scroll through pages and pages of files, just in case the record you’re looking for is hiding there. Organisation by first name. Even more challenging is when a priest chooses to organise his baptismal records by the child’s first name. This means you’ll see dozens of pages of Antonios and Annas followed by dozens of pages of Bartolomeos and Brigidas. Fortunately, this type of record keeping doesn’t happen too often, but when it does it can be a nightmare for research, unless you happen to be looking for one specific person whose name you already know. 3. Create a ‘map’ for yourself. Once you know which items are relevant to your research, and how the priests have organised them within each of these items, I strongly recommend making some sort of ‘map’ or guide that helps you remember where everything is, and how the information is organised. Sometimes the records have page numbers in the corners of the images (although, these numbers can be confusing, as they are numbers of the original books and not of the films themselves). In such cases, you might find it useful to make a table of where the different frazioni are located, where to find certain first names, and where different years/eras start and end in the records. Armed with this ‘map’, you will find your job much easier and less frustrating when you do your research. I mentioned in an earlier article that, when researching parish records, I prefer to work with the digital image library at the Archives at the archdiocese of Trento. Of course, this requires making the trip to Trento (and it also helps if you speak Italian). For many people, however, going to Trento is not always possible. So, even though working with microfilms can be challenging, it is often the more practical option. Hopefully the guidelines I’ve shared in this article will help you approach those challenges with some sort of plan of attack, so you can build your Trentini family tree more easily and with greater confidence. Coming up soon on the Trentino Genealogy blog, we’ll be looking at what to expect when working with the Archives at the Archdiocese in Trento (if you do decide to make the trip), how to interpret parish records from Trentino, an introduction to notaries and noble families in Trentino, and how to use church parchments to understand more about your ancestors’ daily lives. I do hope you’ll subscribe to this blog so you can follow along on this genealogical journey, and read all future articles on this site. Desktop viewers can subscribe using the form at the right side at the top of your screen. If you are viewing on a mobile device and cannot see the form, you can subscribe by sending a blank email to trentinogenealogy@getresponse.net. I also invite you to visit my own extended family tree, with thousands of Trentini, mostly from the Giudicarie valley. You can see that on Ancestry at https://www.ancestry.com/family-tree/tree/110809816/family. Lastly, if you have any questions or comments about this article, or if you’d like to talk to me about researching your family history, please feel free to drop me a line via the contact form on this site. Through extensive research, she has already linked together thousands of Trentini in an extended family tree. Her current research project is called ‘One Tree, One Family, One Humanity,’ the goal of which is create a genealogical ‘map’ of everyone either born in Bleggio, or whose ancestors came from there, from the 1500s to the current era, to serve as a visual and spiritual reminder of how we are all fundamentally connected. 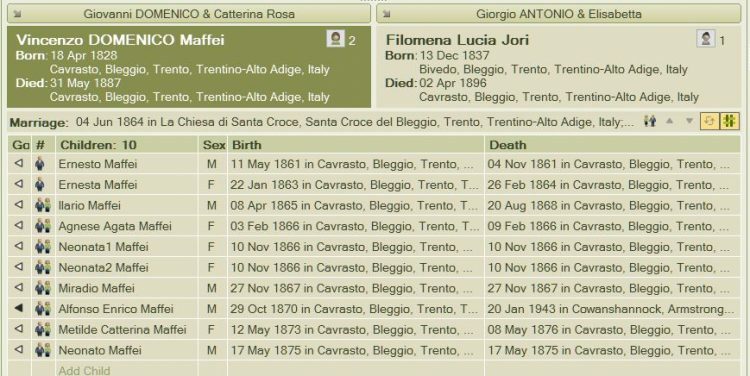 Genealogist Lynn Serafinn explains how to find your ancestors using use ‘Nati in Trentino’, a free online database of baptisms from the Archdiocese of Trento. If you didn’t catch that article, you can read it by clicking HERE. In today’s article, I’m going to be talking about the Nati in Trentino website, because I believe it is especially helpful for anyone who is just starting to construct their Trentini family tree. It is also highly useful for experienced researchers who quickly want to flesh out parts of the 19th and early 20th century in their tree. Nati in Trentino is a free, searchable website located at https://secure.natitrentino.mondotrentino.net. This site contains a database of information taken from ALL baptismal records registered in the Archdiocese of Trento between the years of 1815 and 1923. The project was done by experienced researchers at the Archivio dell’Arcidiocese (the archives of the archdiocese). 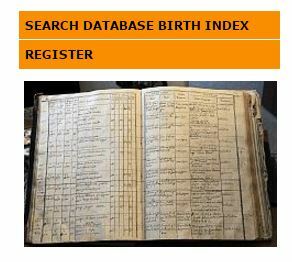 If you click “Search Database Birth Index”, it will take you to a log-in page. If you already have an account, you can log-in here. If you haven’t yet created your free account, you register from that page as well. NOTE to Users of Ancestry.com and similar sites: The Nati in Trentino database is owned by the Archdiocese of Trento, and is NOT accessible via other, commercial sites. The only way to access it is to go directly to the Nati in Trentino website. I think this is the primary advantage of using Nati in Trentino. The people who made this database are not random volunteers (as is the case with MANY other online databases) but official researchers who work for the diocese. They are native Trentini who speak Italian AND have studied Latin. They are familiar with the parishes and local surnames of the region. They have been trained to read old handwriting. Furthermore, these people (and I know some of them personally) CARE about preserving this history. Unlike so many other transcription projects you might find on the Internet, Nati in Trentino is clear and accurate. You’ll especially appreciate this if you’ve ever found yourself pulling your hair out trying to make sense of your Trentini ancestors’ names and villages in US census records or Ellis Island documents. If you are an English speaker, you will especially appreciate the Nati in Trentino website as you don’t need to have any knowledge of Italian to use it. Also, if you are less experienced in working with parish records, it takes the guesswork out of trying to read the priests’ handwriting. Lastly, the most obvious advantage is that it can save you hours of research time. Records that might otherwise take you hours to find via microfilm can often be found within minutes. For speed and ease of use, there really is no other Trentini resource like it (not yet, anyway!). I often use the site to do a ‘first draft’ of certain family groups for the 19th Century. Then, when I next have an opportunity to work directly with the images of the baptismal, marriage and death records, I can start to fill in the missing information. It is important to be aware of what the site can and cannot tell you, lest you inadvertently assume the wrong person is your ancestor. One thing to bear in mind is that this site does NOT contain the full transcription of the baptismal records. Nor does it contain the images of them. 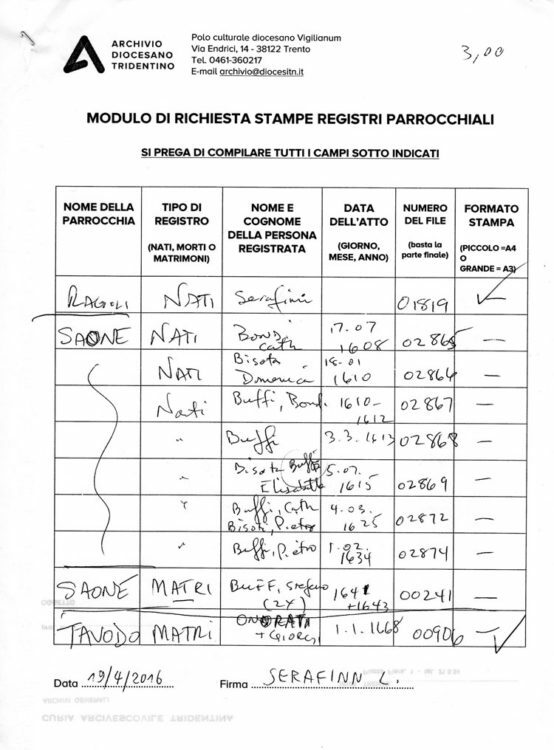 Thus, many things that are probably IN the baptismal record are NOT included in the search results on Nati in Trentino. VERY IMPORTANT (especially for readers in America): European dates are written with the DAY first, followed by the MONTH (the opposite of what is used in the United States). If you see a date that says 06/12/1850, for example, it means December 6th, NOT June 12th. About the date of birth: Prior to the introduction of printed forms (about 1810), parish records would only record the date of baptism, rather than the date of birth. For this reason, most researchers will use the baptismal date as a date of birth in a family tree, if no other record of birth is available. In earlier times, due to the high mortality rate, a child was often baptised within hours of their birth anyway (sometimes by the midwife). But by the 19th Century, there might be a gap of one or two days between the birth and baptism of a child; both of these dates are recorded in most Trentini parish records from about 1810 onwards. Wherever both dates have been recorded, Nati in Trentino will give you the actual date of birth. About parishes: You don’t need to know the parish from which your ancestors came to search the database, but it can really help narrow down your search, especially if the surname is common to several areas of the Province. Fortunately, the search function includes a drop-down menu of all the parishes (which means you don’t need to know how to spell them!). You can find a complete list of parishes in the Diocese of Trento on the diocese’s official website. Europa came from the frazione of Duvredo (written in the left margin). She was baptised the day after she was born. The midwife who delivered her was Margarita Furlini (written under Europa’s name). In fact, if you look closely, you will see that Margarita delivered ALL the babies on this record (that’s four babies in within 20 days). As you can see, there is a lot more to be gleaned from parish records than can be discovered through the Nati in Trentino database. I am not pointing these things out to discourage you from using it, but to ensure you are clear on what to expect when you use it, and also to give you something to look forward to when you progress to the stage where you are ready to study the parish records for yourself. Surname is a required field. Let’s say you are trying to find out more information about your great-grandfather’s sister. To do that, you’d have to be able to search by the mother’s surnme. But on Nati in Trentino, you are required to enter the child’s surname (ie. the surname of the father). So unless you know the surname of your great-great-aunt’s husband, you’re stuck. The surname MUST be spelled completely and exactly as it is in the record. While this isn’t immediately apparent from this form, unfortunately, you cannot use ‘wild card’ searches on the Nati in Trentino website. This means you need to know the exact spelling of your ancestors’ surname as it appeared in the record. For example, while 9 times out of 10 my paternal surname is spelled ‘Serafini’, some priests spelled it ‘Seraffini’. Because there is no flexibility with regards to surname in their search engine, if I search for ‘Serafini’ on the site, I will NOT see any of the ‘Seraffini’ records. Gender is a required field. This means, if you are working on a family, you’ll have to search for brothers and sisters separately. It’s not unworkable, but it can slow down your research. Each search is restricted to a 10-year range. This can also slow down your research, but it’s not so bad once you get the hang of it (TIP: don’t forget, a range from 1900 – 1910 is actually 11 years). I’ve worked enough now with the Nati in Trentino site that I no longer worry about these limitations, as I know (to some degree) how to work around them. Here are some of my personal tips and tricks. Surnames: Because the site has no flexibility with surnames, and because different priests may have spelled your surname differently over the years, you will need to search using all the alternative spellings you can think of for your family’s surnames. Unfortunately, some surnames have LOTS of different variations. If you click here, you can see a table I made of some Trentini surnames with some of their spelling variations. Look to see if your surname is on the table and take note of any variations it might have. Please note that this table is FAR from complete, so if you know of any variations I might not have included, please let me know via the contact form on this website. Use only 1 – 3 letters in the non-required fields: If you look at the form, you’ll see that many of the fields are NOT required: name, father’s name, mother’s name, mother’s family name. Also, for some reason, THESE fields have much more flexibility when you do your search. In fact, I normally enter only a few letters of a name (or even ONE letter), in these fields, so that I don’t inadvertently miss a record that might be spelled slightly differently. Even a common name like ‘Domenico’ can sometimes be spelled ‘Dominco’ in a parish record. So rather than putting in a complete name, I would enter only ‘Dom’, as I know these will be the same regardless of how the priest has spelled the name. Similarly, if I am looking for a child whose mother’s surname is ‘Caliari’, I might just put ‘Ca’ in the mother’s family name field, in case the priest happened to spell the name ‘Cagliari’. The name ‘Bartolomeo’ is sometimes spelled ‘Bortolo’; so if the name of the child I am looking for (or his father) is called Bartolomeo, I would put ONLY the first initial ‘B’, in case the priest happened to spell it that way in the record. 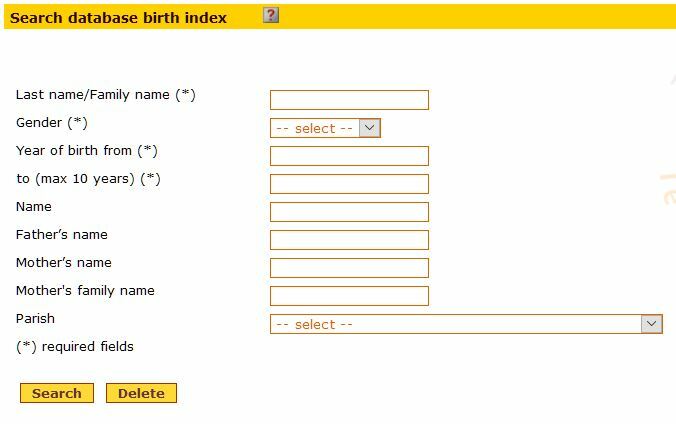 First, search for any children born with the child’s surname during the five years preceding that child’s birth (presuming that this will take you before the 103-year threshold). If you know the name of the parish, this can really help narrow it down. Write down the parents’ names of all of those children. Then, perform your search AGAIN for the child you are seeking, but this time enter the first few letters of the name of a father and mother of one of the other children. If you choose the RIGHT couple, the child you’re looking for will appear in the search results, even though the names of the parents won’t be visible. If you haven’t entered the right parents, the child you are looking for won’t appear in the results. I hope this article has given you some useful information about how to use the Nati in Trentino website, and has inspired you to use it to work on your family tree. If you have any questions or comments about what I’ve discussed, please feel free to reach out to me via the contact form on this website. As I showed in this article, there is much more that can be learned about your ancestors if you study the original parish records. So over the next few articles, we’ll be looking at how to find and use the microfilms of those records through your local Family History Centre. Then, in later articles, we’ll explore working at the Archives of the Archdiocese in Trento, and different ways you can take your research beyond parish records. I do hope you’ll subscribe to this blog so you can follow along on this genealogical journey, and read all future articles on this site. Desktop viewers can subscribe using the form at the right side at the top of your screen. If you are viewing on a mobile device and cannot see the form, you can subscribe by sending a blank email to trentinogenealogy@getresponse.net. I also invite you to visit my own extended family tree, with many thousands of Trentini, mostly from the Giudicarie valley. You can see that on Ancestry at https://www.ancestry.com/family-tree/tree/110809816/family. Lastly, if you’d like to talk to me about researching your family history, you are most welcome to drop me a line via the contact form on this site.